Walbrook is named after the source of water which brought life to the area, The Walbrook, a stream on which the Roman soldiers built a series of baths and a temple to Mithras. It was on his site that the first Christians built a church 700 AD. Eventually a monastery built a foundation begun by the cup bearer to Henry 1st, built almost certainly over the temple to eradicate the pagan site this church was begun in possibly 1085 AD? In 1428 a new church was to be built twenty meters east of the original on land given by Robert Chichley a member of the Grocers Company. We know exactly how big it was, 208 feet by 66 feet. It had a cloister and was one of the hundred churches in the City of London. Interestingly enough at the east end of St Stephen was a street, Bearbidder Lane, the source of the Great Plague of 1665. The only doctor who remained with his patients Nathaniel Hodge has a plaque in the present church! Then early on Sunday 2nd September 1666 a fire broke out in Pudding Lane which was to change the face of London. It was of course the Great Fire of London. Within 24 hours St Stephen Walbrook was burnt to the ground an end to 500 years of a building on the site. Some saw the fire as a judgment on the City, some saw it as a human error some saw it as a major opportunity to begin a vision of a new utopia for the people of London. King Charles II set up a Royal Commission and work began on a new city. It was to be built upon the medieval pattern of streets but it would be built of brick and stone. The city churches and St Paul’s were mostly funded by harnessing the tax on imported coal; By 1700 London was a new city rising like a phoenix from the ashes. 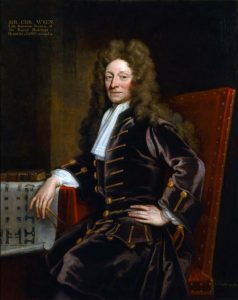 One of the central figures in that redevelopment process was Christopher Wren. From 1660 until, the early 18th century Wren dominated London’s architecture in a way unthinkable today. In an age when there were no professional architects, rather a tradition of gentlemen amateurs his name is synonymous with English Renaissance architecture, in particular the city’s buildings’ of faith. He was multi talented a professor of astronomy a geometrician fascinated by the visual world, inventive and he loved problem solving. Nothing was impossible! It stands as an enduring example of how resilient the City is to change. Wren had to design a new building encompassing the latest in classical renaissance architecture on a very limited site. His answer was to focus on creating maximum space for the interior leaving the exterior to rub up against the large number of buildings around it. The Second World War shows how many of Wren’s churches had simple exteriors because they could not be seen. Wrens solution was to experiment with a dome completely new to the City and the first to be built in England and the precursor for St Paul’s dome to be built after St Stephen. The problem lay in how to support this dome and to provide uncluttered space with sight lines from all over the building and support the dome structure. But the structure meant that the entrance had to be at ground level and the church built above the crypt. By creating a spacious staircase entrance lobby, adjacent to the tower Wren enabled the visitor to ascend into the church h building creating a new dynamic of changing perspectives on each ascent of the staircase. It is not until you are at the top that the whole vista unfolds before you. Wren originally allowed for a new portico to the north of the building to be built over the Old Stocks Market but George Dance’s Mansion House was built instead. We know how pleased everyone was at the building for on 27th May 1679 the Vestry gave a dinner for the architect, masons and joiners as the church was ready for use. The steeple was not built until; 1713 -1717, some think by Hawksmoor. Amongst those buried in St Stephen are John Vanburgh and other notables, including de Courcey Laffan who helped Baron Courbetin revive the Olympic Games. Wren himself lived at 15 Walbrook and was a parishioner as the church was being rebuilt. I like the story of Lord Burlington, the great English traveller and entrepreneur meeting the Italian sculptor and architect Canova in Rome who when they talked about the City of London mentioned Wren’s St Paul’s but did not know St Stephen Walbrook. Canova told Lord Burlington to return to London and to seek out St Stephen for, “we have nothing to touch it Rome”, Sir John Summerson has described the church as ‘one of the few church, ‘in which the genius of Wren shines in full splendour.’ Nicholas Pevsner lists the church as one of the ten most important buildings in England. As a member of the King’s Commission Wren set his mind to create a new architecture for faith, the first since the Reformation. He was responsible for the recreation of fifty one of the new buildings Robert Hooke and Nicholas Hawksmoor were his assistants. His buildings mirrored the theology of his day, the Church of England as a reformed Catholic church reflected the English attempt to keep the main threads of sacramental life but with a new twist of being able to hear and see everything which went on in the church building. Wren designed and built auditory churches, where no member of the community would be more than thirty feet from the action. Some see St Stephen Walbrook as Wren’s major city church after the Cathedral. It was a difficult church to rebuild. Some of the crypt remained and the Walbrook River caused water problems for any designer. It was one of his earliest works built from 1672 – 1679. It is certain that he himself was responsible for the design and the build. It cost £7,672, a large amount of money then.